There are some bookmark things that are considered compulsory for the certain sections of the house like a bed for the bedroom, coffee table for the living and so is a kitchen island table for the kitchen space. And for a modernly build and designed kitchen area we have a very stylish and super cool kitchen island table which can beat any market bought one with its gorgeous design and impressive shape. 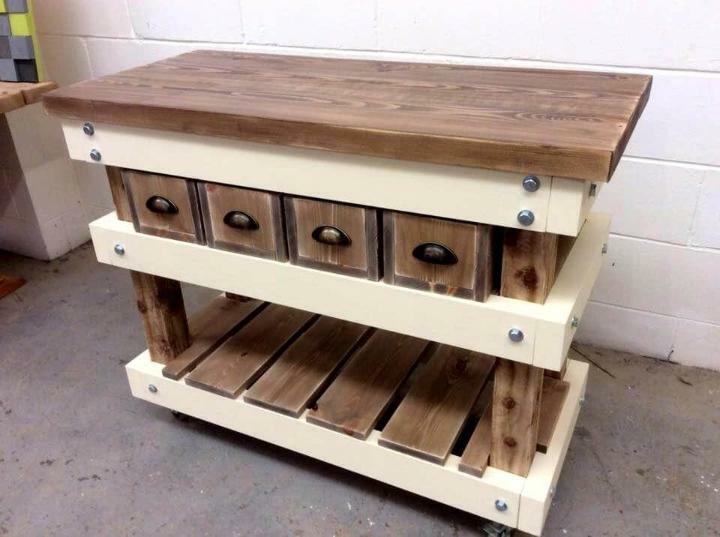 But coming out from the pallets it is totally a cost efficient possession so have a look at this DIY pallet kitchen island table featuring a wide table top, mini drawer row and a broad base at the end to let you store and organize a bunch of your kitchen apparatus on it. 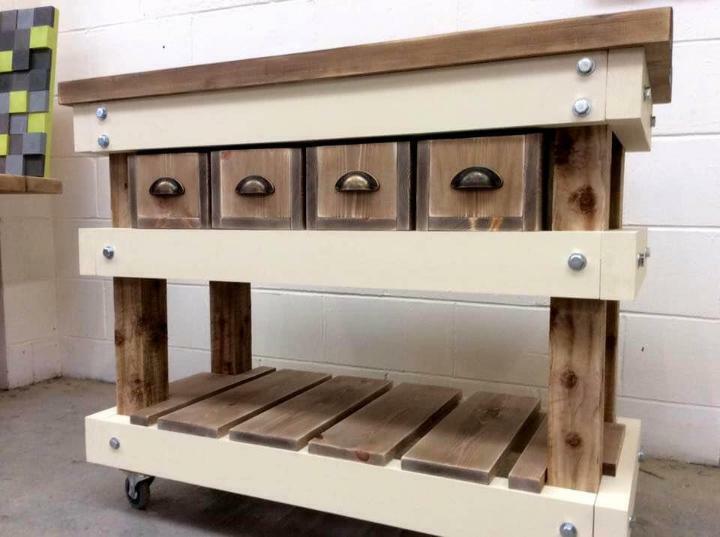 Top would let you prepare for food, the drawers would let you house your entire cutlery and the base can act to hold some bigger and heavy things like cookers, pans and juicers etc. the white and chocolaty stain contrast makes it look much more gorgeous and marvelous. 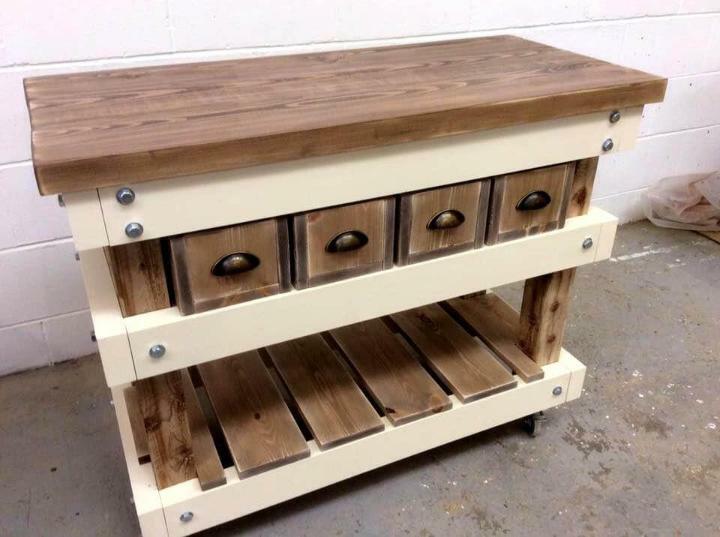 This handmade and pallet kitchen island table is the mouth piece of beauty and functionality as it is so bold in looks and aslo features many practical and useful things with the gorgeous hardware used to make it look more advanced. The pallet wood has been cut into thin and thick pallet slat pieces which have been stacked together very nicely and finely to get that industrial style look of the table with modern design and contemporary style of the shape. The more fun and fabulous thing about this island is that it has small and cute drawers under the to where you can hold things like spoons, forks and other such cutlery and the knobs of the drawers are made of metal and reflect a very stylish and gorgeous look. 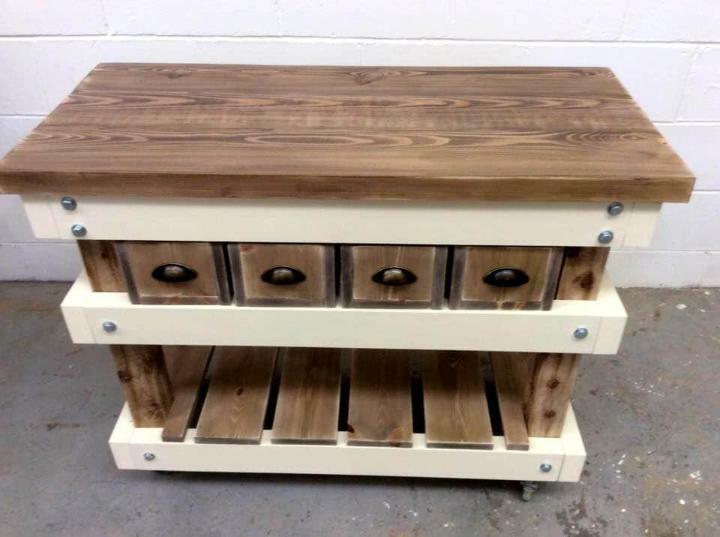 The bolts and the screws visible on the island show how sturdy and strongly the table has been build and to add more four moons of beauty it has been stained in the great combination of milky white and chocolate.